The biggest and easiest way to spot that there is a problem with your web hosted e-mail is when you try and pick up your new mail and find you haven’t received any for a long period of time. That’s not a scientific method, but not receiving e-mail, or getting reports from other people that they are not receiving e-mail from you, is a good indicator that something is wrong. No new e-mail is received for an extended time. This may sound obvious, but just because you don’t have new e-mail doesn’t necessarily mean there is a problem. If you’ve had your e-mail account for a while you’ll know how regularly new mail comes in. If you haven’t had any for a period of time that would be unusual under normal circumstances then you know you should be concerned. You attempt to send an e-mail and your computer reports that it failed to send it. Failing to send can occur as a result of a number of different issues, so read the error message carefully. Sometimes after you have sent e-mail, an “e-mail undeliverable” message appears in your mailbox. This message indicates that there is either a problem at your end or the recipient’s end. The failure message can be hard to decipher but can tell you which end the problem is at. Sometimes friends, contacts, or colleagues contact you some other way other than via e-mail and tell you their messages are not getting through to you. The fault may be on their end, but you should ask them exactly what error message they are getting to ascertain which end the problem is at. Your site or server has been blacklisted. 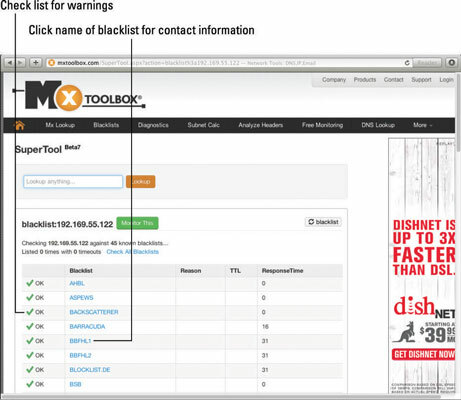 The first thing to do when there is a problem is to go to a security site such as mxtoolbox.com/blacklists.aspx, type your IP address in, and click Blacklist Check. The security site runs a scan on your site, and it checks with the major spam blacklisting organizations to see whether your domain name or your server IP address has been blacklisted. Your mailbox is full. 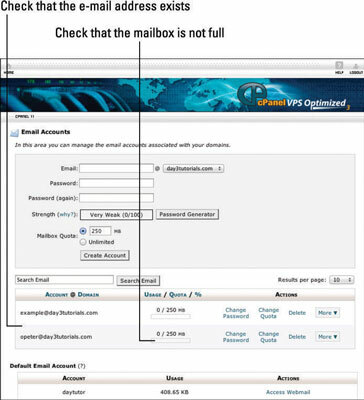 On most web servers, you have to set a size for each mailbox. When your mailbox is full, new mail is rejected until you either clear some space or increase your mailbox size. To clear space, try emptying the trash folder or junk folder and go through and delete any mails you don’t need. A good way to clear a lot of space quickly is to find any e-mails that have large attachments, download the attachments to your computer, and then delete the e-mail. The mailbox does not exist. Sometimes you might want to create a special e-mail address for a particular project or event to help you collect all responses involving that project in one place. It’s easy to overlook actually creating the mailbox in the rush of marketing and sharing the new address to use. Mailboxes also sometimes get deleted by accident. Your mail server needs to be restarted. Many problems with computers can be fixed by simply shutting down and restarting. Your mail server is no exception. If you have a Virtual Private Server (VPS) or dedicated server, you may find that you have access to a backend to the control panel or to additional services on the control panel that most shared hosting users are not privy to. For example, with cPanel, most VPS hosts and dedicated server hosts give you login details so you can use management software called WHM. The WHM software opens up a whole new array of facilities that normal cPanel users do not have access to. Log into WHM using the details provided to you by your host. Scroll down to the mail section near the bottom of the left-hand menu. Select Repair Mailbox Permissions and click Proceed. The command runs through all the associated file permissions related to your mailboxes and fixes any that are set wrong. Sometimes the permissions get themselves messed up for seemingly no reason. You see a list of all the e-mail waiting to go in or out of the server. If there is a lot of mail in here, it may be that there is a spam mail script somewhere on your server being used to send e-mail without your permission. Scroll down to the Restart Services section and click Mail Server (exim). Click Yes. This restarts the mail server. You could also try restarting the IMAP and POP services.